Anyone who knows me will tell you I have the biggest sweet tooth. I'd be quite happy living off cakes, biscuits and chocolate for the rest of my life, but sadly, I'm not that lucky! Just before Christmas, we had a Christmas Bonanza at work so I took the opportunity to get my bake on and make some Chocolate Orange Shortbread Biscuits. Shortbread is my favourite type of biscuit as it's really sweet and literally melts in your mouth - if you have a good recipe! This was the first time I'd tried out this recipe and I have to admit, I did improvise a bit from the original due to lack of ingredients so I've pretty much just made up my own version! Baking is all about experimenting any way right? 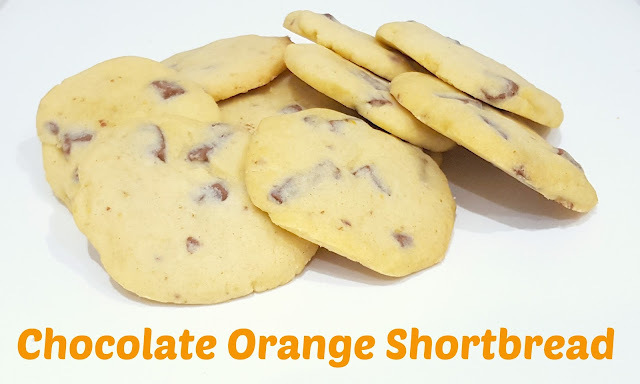 This shortbread doesn't need many ingredients and is a perfect recipe to try to replicate for beginners but also experiment with flavours for the more adventurous. Mix the butter and icing sugar in a bowl, add the orange zest followed by the egg yolk and beat together until light and fluffy. Add the chocolate (I cut mine into messy style chunks) and the flour. Mix together until it forms a crumbly texture... well the recipe says crumbly, but mine was quite a wet mixture and still turned out great! Sprinkle plain flour on to the work surface and roll the mixture into a log. Wrap in clingfilm and put in the fridge for one hour. Cut the log into 1-2cm slices. I personally patted mine down as I like thin shortbread but it's completely up to your preference. Place on a non-stick tray and bake for approx. 12 minutes by which time they should be turning golden. When you first take them out they may seem really soft but they'll harden up quickly. Be careful not to overcook them as it's deceiving when they come out of the oven soft, you're always tempted to bake for longer. I baked mine in small batches so I could get the timings just right! For all of those sugar addicts like me, sprinkle with sugar and serve. Let me know if you give these a go, my mouth is watering even writing this post! I can't wait to make them again!